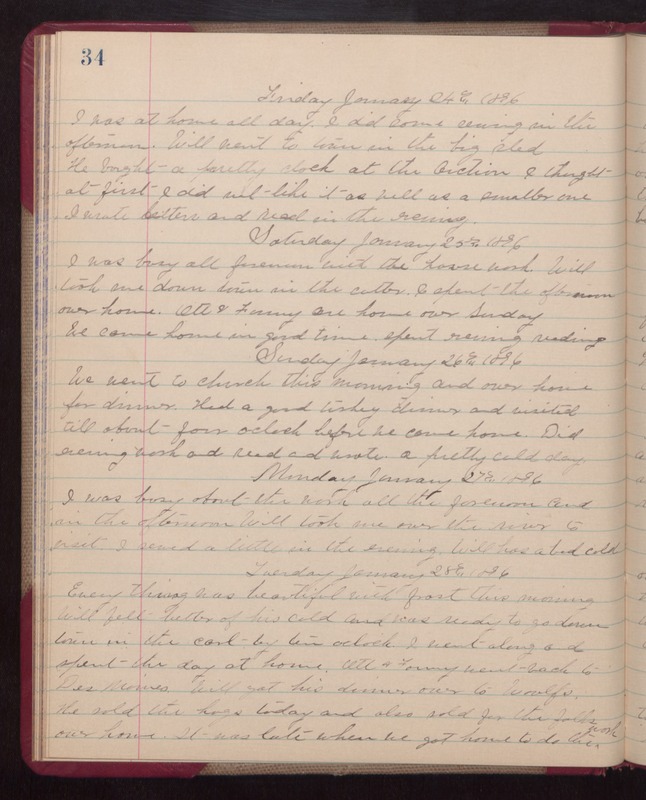 Friday January 24th 1896 I was at home all day. I did some sewing in the afternoon. Will went to town in the big sled He bought a pretty clock at the Auction I thought at first I did not like it as Will as a smaller one I wrote letters and read in the evening. Saturday January 25th 1896 I was busy all forenoon with the house work. Will took me down town in the cutter. I spent the afternoon over home. Ott & Fanny are home over Sunday We came home in good time, spent evening reading. Sunday January 26th 1896 We went to church this morning and over home for dinner. Had a good turkey dinner and visited till about four oclock before we came home. Did evening work and read and wrote. A pretty cold day. Monday January 27th 1896 I was busy about the work all the forenoon and in the afternoon Will took me over the river to visit. I sewed a little in the evening. Will has a bad cold. Tuesday January 28th 1896 Every thing was beautiful with frost this morning Will felt better of his cold and was ready to go down town in the cart by ten oclock. I went along and spent the day at home. Ott & Fanny went back to Des Moines. Will got his dinner over to Woolfs. He sold the hogs today and also sold for the folks over home. It was late when we got home to do the work.